Windscreen wiper blades don’t get the respect they deserve. They remove rain, snow and sometimes even ice and dirt from the windscreen of your car and they do it quickly and smoothly, at the push of a button. They endure extremes of temperature, winter weather to scorching sunshine. They may have to operate for hours at a time. And yet they’re made out of thin, flexible rubber — not exactly the sort of material that can take this kind of abuse indefinitely. This makes windscreen wiper blades one of the hardest working — yet least durable — parts of your car. Over time, they’ll crack, become misshapen or lose their flexibility. Even if you were to live in a sunny dry climate without much rain — Southern California, for instance — Don’t think that your wiper blades will last longer. In fact, the heat and lack of moisture can damage the blades even if you never turn them on. Similarly, extremely cold weather can make the blades stiff and easily fractured. Most experts say that wiper blades need to be changed every six to 12 months, though this depends both on weather conditions and on what make and what the blades are made out of. You’ll know when your wiper blades need to be replaced because you’ll see streaking as they wipe the moisture from the windshield or even large gaps where no water is being removed. They may start making squeaking or chattering sounds (though this can also happen if you run the wipers when the windscreen is mostly dry). If left unchanged for too long, the material of the blade can shred and break loose from the arm. This can actually cause damage to your windscreen, as the metal or hard plastic of the arm scrapes across the glass. You don’t want this to happen. 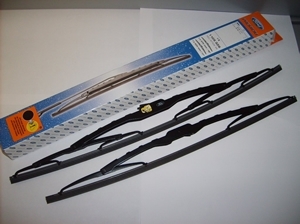 We stock a wide range of Wipers. Just give us a call or pop in. We fit them FREE of charge.